The closest an ale can legally be to wine! With 51% of the fermentable sugars coming from grain and 49% coming from grapes, Mixed Media is a complex saison-esque ale brewed with a distinct Belgian yeast strain. Using a late-harvest Viognier grape must from our friends at Alexandria Nicole Cellars in Washington, you'll find notes of white grape and melon in the aroma, and greeted with a spicy white wine body in every sip. If you were (or still are) a fan of our Noble Rot or Oak-aged Noble Rot, you'll be delighted with the addition of Mixed Media to our lineup of beer-wine hybrids. 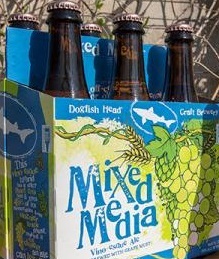 “We’ve been experimenting with grape juice and must in the brewing process with beers like Midas Touch, Red & White, Noble Rot and Sixty One, since we first opened 23 years ago as the smallest American craft brewery,” says Dogfish Head founder & CEO Sam Calagione. “By blending the two seemingly opposite worlds of beer and wine together we’ve discovered that they collide quite nicely, and the combination of the two adds an additional thread of flavor and a layer of complexity to the mix." As our newest spin in the beer-wine world, Mixed Media appeals to both the Pinot Gris and beer drinker alike with a crisp, dry and tart ale that will leave you 'puckering' for more.